A gun show will go on this weekend in Stamford, Conn., despite critics who say that it is too close and too soon after the shooting at Sandy Hook Elementary, where 20 first-graders and six educators were killed, just 40 miles away in Newtown. The East Coast Firearms Show at the Stamford Plaza Hotel is organized by Westchester Collectors. A flyer for the show says it offers the "best of the best of vendors, offering 250 tables of antique and historical arms." 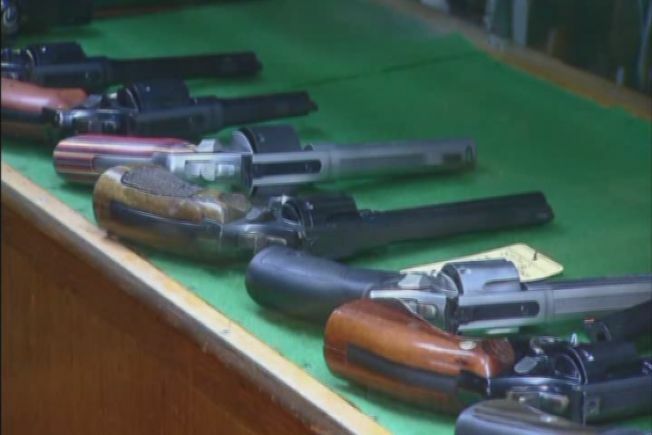 Similar gun shows by the same promoter in Waterbury and Westchester County were canceled. Stamford Mayor Michael Pavia said he felt the timing of the event was problematic, just over three weeks after the Newtown school shooting. "It seems insensitive to have the event continue," Pavia said. Stamford Police Captain Richard Conklin said that while he understood some were unhappy about the event, it is being staged at a private facility and can't be forcibly canceled. "When you think of gun shows this is not your typical gun show," Conklin said, adding that the show was for collectors of antique weapons and nothing dangerous. Conklin said he'd dealt with the organizer before and never had an issue. "We're going to maintain a presence there to ensure that they continue to be compliant with state, local and federal laws," Conklin said.